100 remarkable photographs by 52 contemporary photographers explore the relationships between people and animals. 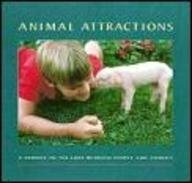 Not just limited to cats and dogs, this book shows a variety of animals such as monkeys, snakes, rabbits, horses, and others. Includes images by Kertész, Winogrand, Lartigue, Mary Ellen Mark, Mapplethorpe, and others.